Many companies are typically stuck in the traditional ways of managing their business, which is normally related to a Profit Center, Cost Center, and or Legal Entity focused model. This structure can be advantageous from a tax reporting or internal management perspective. However, we have been observing a trend that organizations of all sizes are moving away from this legacy approach to operating models that account for how consumers are consuming products and how that relates to the profitability of individual products. Profit/Cost Center Legal Entity structures do not allow the business to operate in the same way its consumers consume its products/services, which can put an organization at a severe disadvantage due to its inability to effectively analyze the profitability of a product line. As a result, the new trend is to manage and operate the business the same way consumers consume its products. This is normally accomplished through a reorganization of the business into segments or product relationships oftentimes by geographic location. To do this, companies are shifting to adopting a Target Operating Model (TOM) that involves the composition of Strategic Businesses in a way that makes it possible to assess the individual profitability of specific products/services. As an example, under a legacy operating model, your organization may have 100 different profit centers across the world, where profitability is measured by profit center. As a general assumption, profit centers usually have many different products/services that roll-up into them. This can make it difficult to analyze the profitability of one product when it is paired with other different products. However, under a TOM structure, your organization would ideally have a lot less than 100 unique Strategic Businesses where the revenues, costs, and profits all roll-up together for one set of products instead of mixing product types together and accounting for costs and profits separately. This way, your business would be able to analyze whether or not it would be feasible to discontinue a lagging product category or invest more into a booming product category without worrying about other products skewing the analysis. Another advantage of this system is the ability to hold business leaders accountable for their area of responsibility in a holistic way instead of simply holding only certain individuals accountable for costs and profits separately. Many companies, large and small, turn to implementing Target Operating Models (TOM), either due to the failure of a previous operating structure that does not support the organization strategy, or due to a significant structural change such as a large merger or acquisition. Working in the Oracle-Hyperion space, we have recently seen many of our clients embracing TOM and running more efficiently as a result. An Effective TOM will always define the corporate strategy and align it with how each individual member in the organization fits into the TOM. This allows everyone from the CEO to a staff analyst to have a common understanding of the business. 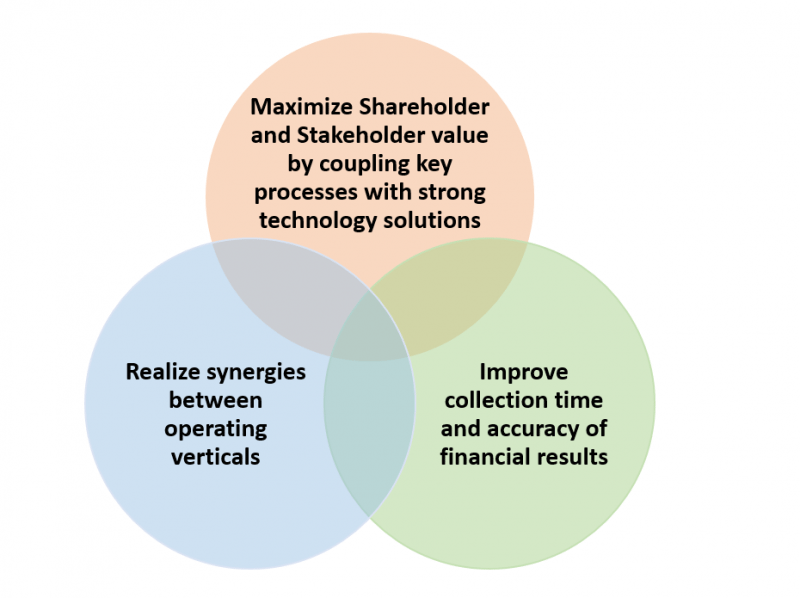 Target operating models are essentially a high level view of how a company can be structured to realize the benefits of synergies between operating divisions, provide a clear vision and strategy to employees, and ultimately provide a greater return on investment for stakeholders and shareholders alike. Whether you are in the middle market or Fortune 500, if you are looking to implement a TOM, there are many different approaches for the implementation. As a starting point, it is imperative to consider the relationship and interconnectivity between the three most important components of execution: People, Process, and Technology. TOM can be very fussy! It isn’t fun for anyone to deal with a fussy TOM! If not executed properly, an organization could easily end-up with a TOM that never stops kicking and screaming no matter how much attention you give it! TOM implementation has provided many benefits in key operational and financial areas. As mentioned earlier, we will focus on how the company has realized benefits from focusing on People, Processes, and Technology. Having the ideal mix of People, Processes, and Technology will make implementing a TOM at any organization much smoother and also much more relatable to the individuals in the field since they will be included in the improvements every step of the way. During the implementation of a TOM, an organization can be presented with the opportunity to correct and revitalize antiquated and inefficient cultural norms from the top down. Some main areas of focus for our example company have been: Training, finding synergies within the organization and acting on them, and putting the right people in the right positions to enable execution on key goals. Implementing a new TOM can be especially advantageous when the company is on an aggressive M&A path and could benefit from the standardization in the areas mentioned above. As a prime example, if there are newly acquired companies, putting a well-executed TOM in place can reduce inefficiencies from a training and staffing perspective. 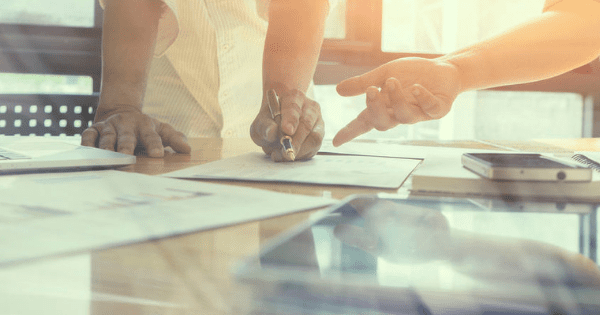 If there are clear guidelines around how the business should operate and who should be responsible for certain pieces, there are a lot of opportunities to provide meaningful training and structure to even the most complex acquisitions. As an approach to maintaining the clearly defined structures mentioned above, our example company has found success in passing responsibility to individual operating locations that rollup into Strategic Businesses by product. Some of these responsibilities include: producing accurate Actuals, Forecasts, and Budgets, with targeted direction from the corporate finance organization. A benefit of this approach is that the corporate finance team now has more time to analyze the final results and recognize trends as opposed to being inundated with correcting local financials. During the implementation of a TOM, an organization can be presented with the opportunity to correct and revitalize antiquated and inefficient processes and procedures from the top down through combining effective operating solutions with a comprehensive technology plan that provides standardization, traceability and one source of the truth. Some main areas of focus for our example company have been to: Realize synergies between operating verticals, gain efficiencies in operating costs, and provide one source of the truth for everyone in the organization. When discussing TOM from the perspective of a corporate finance organization, Process and Technology go hand-in-hand. In the People section above, we mentioned the company’s success in passing key responsibilities to individual operating locations. This would not be possible without strong procedures and technology solutions. Our example company has realized a large amount of success with implementing well thought out processes and Oracle-Hyperion EPM products to realize operational synergies and one source of the truth reporting for all users of the corporate Oracle-Hyperion EPM systems. At our example company, Oracle-Hyperion EPM systems have provided over 200 individual operational locations tools to control the feed of their Actuals, Forecast, and Budget into the corporate Oracle-Hyperion EPM systems for legal and management reporting across over 10 different product segments. Due to the flexibility of the Oracle-Hyperion EPM technical solutions, operating locations quickly keep pace with operational consolidations and restructuring with a high level of accuracy. The corporate team reaps the benefit of providing timelier reporting to regulatory agencies, Wall Street, and management with greater accuracy. TOM implementations are not straight forward and require a great deal of planning and coordination to successfully role them out. One of the key challenges when working with TOM aside from initial implementation is the continued maintenance and evolution of an existing TOM solution. Many of the benefits of TOM implementation discussed in the Benefits section listed above can easily become a troublesome issue if there is a drastic business change that must be addressed to ensure continued success of a TOM. Common examples of drastic business changes could be a: large merger, acquisition, or senior management change. All three preceding scenarios will bring immense amounts of questions and uncertainty to Shareholders and Stakeholders associated with your organization. This section will focus on key challenges encountered by the finance organization and how, at a high level, Oracle-Hyperion EPM products came to the rescue and turned challenges into benefits. On the eve of a large organizational change such as a merger, acquisition, or senior management change, the benefits of implementing a TOM from a People, Process, and Technology perspective can easily become challenges. For example, if your organization goes through a large merger, your employees will have been trained to follow the current TOM of the legacy company and other employees from the merger may have been trained to follow a different TOM. This difference in operating models can take a momentous amount of effort to overcome, from areas such as operational inefficiencies, to overcoming differing management and reporting styles. Our example company has been able to successfully overcome the challenges of going through many of the organizational changes listed above with a large part of the success due to the successful rollout of streamlined, flexible, and auditable Oracle-Hyperion EPM closed consolidation, budgeting, and forecasting tools. I know it may be hard to fathom that such momentous organizational challenges can be largely mitigated by the appropriate financial systems. But, just imagine that your company is going through a large merger, but you have the power of a flexible and well-documented financial tool in your corner. Outside of technology, one of the other main challenges when implementing a TOM or going through a change to an existing TOM is any disconnect between critical People and Processes. When working with TOM, as mentioned in the Benefits section, there are many benefits related to TOM implementation, such as: Training, a clear organization structure, and synergies between operating verticals. 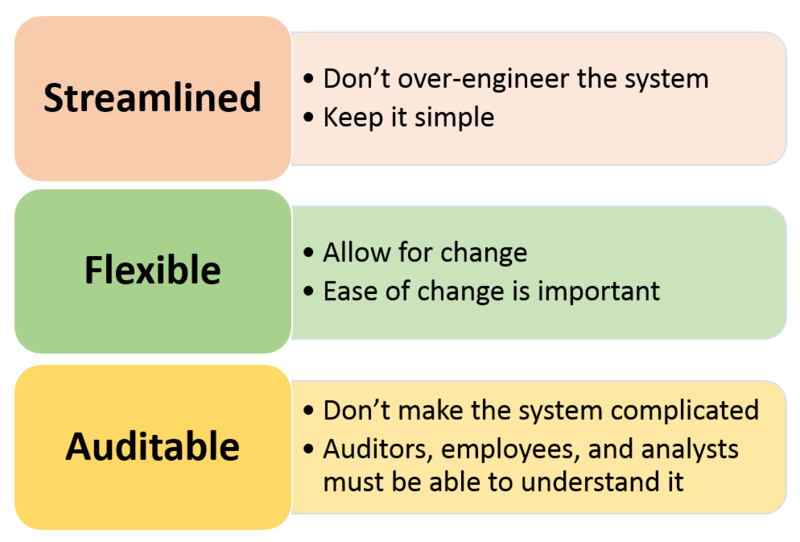 However, each of these benefits can become a challenge, especially if your organization is undergoing a large change. Some of the most significant changes that will impact either implementing a TOM or an existing TOM is a merger, acquisition, or divestiture. For our purposes here, let’s focus on mergers and acquisitions. Since M&A (Mergers and Acquisitions) is a normal part of many businesses, this is something that must be accounted for when implementing a TOM as it can be your biggest challenge. 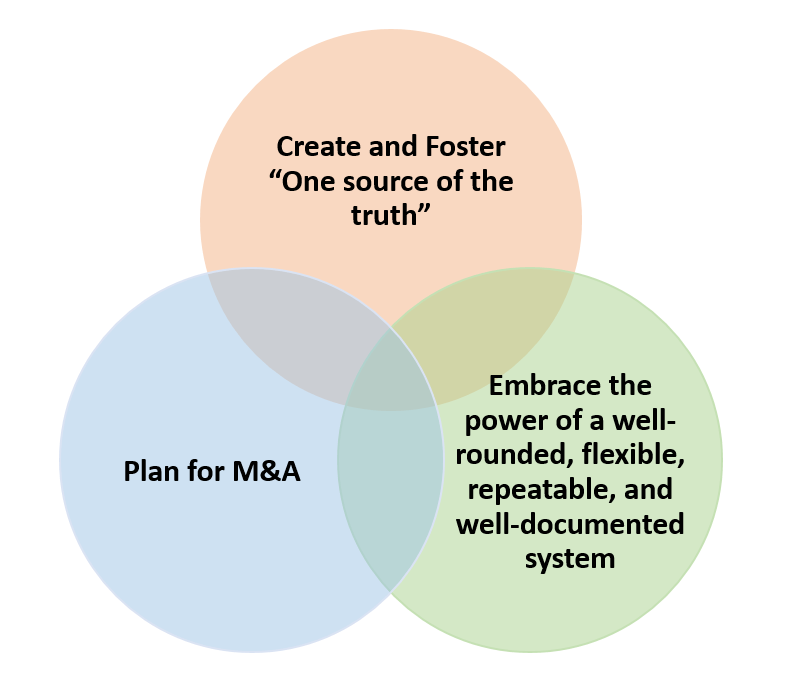 When implementing a TOM, even if your company does not have a major M&A history, these activities should still be kept in mind from a People, Process, and Technology perspective. When forming the strategy and maintenance approach around your TOM, you should take into account what might happen to your business and how it may change on the eve of M&A activities. There are many considerations here that can become serious challenges if they are not planned for. Now, I know at this point, you are saying that “There is no way I can plan for everything that could happen as a result of M&A activity, there are so many unknowns” – good news, we agree with you! You cannot plan for everything, but your organization can put a framework in place that will allow for flexibility and adaptability. During M&A activity, there may be inefficiencies related to training, organization structure, and operating synergies. Thorough documentation and a collaborative mindset around your TOM implementation will go a long way when trying to merge two large companies or integrate a smaller company into a larger one. Our example company has successfully merged and has also made many acquisitions with the support of a world-class Oracle-Hyperion EPM closed consolidation, forecasting, and budgeting solution that marries People with Processes to create One Source of the Truth Reporting. One Source of the Truth Reporting can be defined as providing a central repository where everyone in the organization can go and produce reporting that is structured the same way and derived from the same underlying methodologies. This is very important to the successful implementation because it allows the whole organization to speak the same financial language without corporate finance needing to get involved as a translator. For our purposes here, let’s stick with acquisition plans. Our example company has come to realize that it is vastly important to have a solid plan to integrate acquisitions into the current organization. This plan, similar to TOM and as a part of TOM should include People, Process, and Technology. From the perspective of the corporate finance organization, one of the most important business partners once an acquisition has been completed is a well-rounded, flexible, repeatable, and documented financial system. By making a financial tool one of the pillars of your TOM implementation, you can mitigate risk around financial reporting inefficiencies and quickly get new People and Processes integrated into your organization. As a result of careful planning at all levels of the organization and successful implementation of a wide array of Oracle-Hyperion EPM products, the organization has been able to successfully roll out the target operating model and has been able to reap the benefits of a successful TOM implementation that include: People with a clear direction, Processes that don’t conflict with one another, and technology that empowers further growth and expansion of the company. Implementing TOM helps you run your business from a strategic standpoint. With so much change happening in today’s business world, management can benefit from getting the visibility they need into their products that will allow them to put the focus on the most profitable ones. In turn, this will also give them the ability to reward the parts of the business that are most strategic to them. Without a TOM In place, your company could miss key business opportunities or subject itself to additional risk that competitors who have implemented TOM are not facing. With continued use of Oracle-Hyperion EPM products, the finance organization will continue to realize benefits from having implemented a world-class set of financial tools that will allow the company to be agile when faced with any other large-scale changes, including changes to the TOM. As we know, TOM can be quite the fussy and temperamental business partner, but if your organization has an action plan that includes the integration and collaboration of People, Processes, and Technology, the path to success is apparent. As business leaders and Oracle-Hyperion administrators, you may be wondering if you should face TOM alone or if you should call in reinforcements. Please stay tuned for the next post in the TOM series where you will learn the specific benefits of approaching TOM with friends like FDMEE and system allocation logic instead of just approaching him with antiquated and error prone excel models. The next post will also detail specific examples of how Oracle-Hyperion EPM tools can help keep TOM flexible in uncertain times. If you have any questions, we’d love to hear from you. You can reach out to one of our Business Architechs here. We’d be more than happy to see how we can help.